Provide comfort for the family of Christiena Kimmett with a meaningful gesture of sympathy. 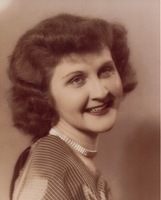 Christiena May Kimmett, age 89, of Kingston, passed away peacefully at KHSC on March 26, 2019. She was born February 3, 1930 in Eldorado Ontario, the youngest daughter of Harry and Margaret Walden (White). She is pre-deceased by her parents, her infant son Ronnie and her brother Archie Walden (Mabel). She attended St. Peters Presbyterian Church in Madoc and loved to sing in the choir. As a young adult she worked at the Ontario School for the Deaf in Belleville. She married and moved to Kingston to start a family. Divorcing when her daughters were in their teens, life was not easy for a single mom. She had a determined spirit though and worked retail at Reg Walton Drugs, Steacy's and Woolworths to make ends meet. She was forced to retire after a car accident in 1985. Always sharply dressed, she had an affinity for shiny objects. She had her ears pierced four times each ear, most likely so she could wear more "bling". Mom was known for her crushing hugs, soprano voice and she loved to dance. She had a generous nature and valued honesty, whether you liked it or not. Above all else she loved her family. She is survived by her daughters Debbie (Robert) Stevenson and Darlene (Stephan) Hiller, both of Kingston, five grandchildren and six great-grandchildren. There will be a private interment at a warmer date. Donations to the Humane Society would be appreciated by the family. "Mom, may you be singing and dancing your heart out in heaven". To send flowers in memory of Christiena May Kimmett (Walden), please visit our Heartfelt Sympathies Store. We encourage you to share your most beloved memories of Christiena here, so that the family and other loved ones can always see it. You can upload cherished photographs, or share your favorite stories, and can even comment on those shared by others.